Brentwood: My home since first moving to Los Angeles almost 7 years ago, is obviously my favorite area to live in Los Angeles. It's a very quiet, mostly residential neighborhood, with only a few commercial areas. It's residents consist of mostly young professionals, moms in yoga pants, families and beautiful dogs. You won't find a cool new restaurant opening every couple weeks or a selection of nightclubs to go out in - in fact Brentwood really doesn't have many people coming or going aside from it's residents or Santa Monica neighbors and perhaps that is why I like it so much. I love being able to walk to Whole Foods during the week and get my regular salmon and avocado roll, meet a friend at New York Bagel (where I religiously order a matzo ball soup and cheese bagel with lox cream cheese) on Sunday mornings, take a Soulcycle class, get pampered at Côte (a French Riviera inspired nail salon), run down beautiful San Vicente, meet the girls for drinks at Tavern, pick up a coffee at the many good options including Alfred's (Alfred's tea coming soon) or my favorite Caffe Luxxe, hike the Westridge-Canyonback Trail, or head to my very favorite spot, The Brentwood Country Mart. If you know me personally or follow me on Instagram you will see I take every opportunity to frequent the adorably curated shopping center that despite it's upscale clientele tends to still feel very unassuming and laid back. I love the Sugar Paper store for it's beautiful stationery and tend to by a lot of great gifts there for friends, eat the delicious fried chicken at the Reddi Chick stand, grab a new book from the best seller's wall at Diesel, and lust over basically everything at the Goop lab. The only sit down restaurant, Farmshop, also has a bakery with the most perfect peanut butter cookie to pair with an almond milk latte from Caffe Luxxe. The little market at Farmshop also has a great selection of cheeses and other good specialty prepared food and wine, perfect for a dinner party hostess gift. And I often just can't resist a cone at Sweet Rose Creamery on a hot summer day (or basically any day). The Brentwood Country Mart is the place I always take guests as it has become a little slice of my LA home! Speaking of slices, the marble cake at Susie Cakes is my favorite cake and I get it for my birthday every year, and you can order it by the slice too! 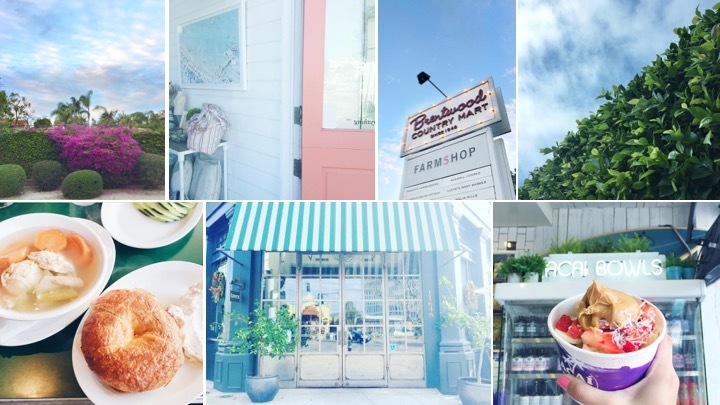 BRENTWOOD SNAPSHOT: Take a run towards the ocean on San Vicente boulevard, grab a coffee at Caffè Luxxe, brunch at Tavern, explore The Getty, lunch and shop at The Country Mart, go for a sunset hike at Westridge trail, drinks at Baltaire, dinner at Katsuya. If you must, post drinks at the tiny bar at The Brentwood. 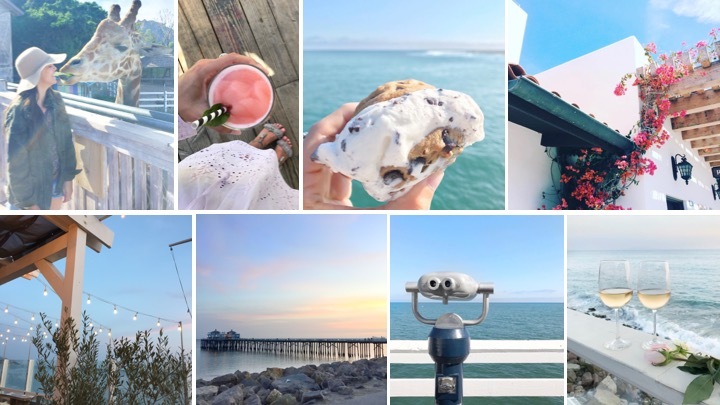 Santa Monica: I recently moved to Santa Monica but even before now, living in Brentwood felt like living in Santa Monica because it's just so close. Since Brentwood is so small, Santa Monica often serves as an extension of the neighborhood, with plenty more restaurants, shopping, bars, and fun things to see and do. The best thing about Santa Monica is obviously it's a proximity to the beach, with a pier I only recommend going to if you must and it better be your first trip to Los Angeles; otherwise I WILL judge you. One reason worth visiting, however, is for the bike path that stretches north up to the Palisades and south all the way to the Southbay. I am not a huge fan of the Santa Monica beaches because they are so long and often crowded so I usually ride my bike as far north as possible to the shorter beaches with less people. I love to grab some sub sandwiches at Bay Cities and some fresh bread, cheese and olive tapenade and take it to the beach for a little picnic at sunset. In the summer, the Pier has free concerts every Thursday, which is fun if your cool with crowds and drunk teenagers. Aside from the beach, I often head to Santa Monica for the restaurants. There are so many good spots but some standouts are Blue Plate Oysterette, Forma, Kazu-Nori, Coast at Shutters on the Beach and Ivy at the Shore. Forma has pasta served straight from a large wheel of cheese. I have done a lot of insta-stories of this and I can honestly say the truffle tortellini is a meal I think about often! Ivy at the Shore is just beautiful, even prettier in my opinion then it's very Hollywood counterpart - The Ivy. The rosè champagne sangria is worth every cent and the whole restaurant is very reminiscent of Palm Beach, pink with florals and is quite instagrammable. One of my favorite brunch spots with an ocean view is Coast at Shutter's, an adorably East Coast inspired hotel on the beach. They have a delicious lobster roll and even though it's not on the brunch menu they usually let me order it. Kazu Nori has quickly become my favorite sushi spot, which serves a very simple menu of just hand rolls and I dream almost everyday about the toro roll and blue crab. Similar to Sugarfish (who's under the same ownership), they have a la carte options but the pre-fix menu is the best way to go. I go all the time for lunch or quick and often casual dinner. The same owners also created a pasta spot, Uovo, with very reasonably priced dishes you order straight from the counter. It's amazing and I can't wait to go by myself, eat the tortellini crema di parmigiano and leave with no shame! It's a simple concept and quite delicious! One more spot worth mentioning that is great for drinks and some snacks is Ester's Wine and Cheese where they have great drinks, my favorite being the aperol spritz and Spanish gin + tonic, and for snacks the delicious grilled cheese, lavender almonds and any of the cheese plate options! If you're still hungry after, head next door to Cassia for some Singaporean food, my faves are the kaya toast and laksa. There are lots of great areas in Santa Monica to spend time but my favorite is Montana Avenue. It's a quiet street with lots of shops and restaurants, surrounded by mostly residential properties and also is my favorite street to ride my bike down. This is where Forma is and one of my favorite desserts, a slice of peanut butter and chocolate chiffon, at Sweet Lady Jane. Montana Avenue has a lot of smaller, upscale boutiques, similar to Main Street, while the 3rd Street Promenade and Santa Monica Place have all the mainstream brands like Gap, Bloomingdales, Forever 21, Nordstrom and is quite touristy. The Bungalow can be a hit or miss but I do recommend you go as it's a quintessential Southern California spot with ocean views and a very relaxed, beach house feel. It's like being at the cool kid's house party and the crowd tends to live up to that theme. My favorite time to go is at sunset on a weeknight if you can, but I tend to try and leave after happy hour as the crowd gets a bit too messy and crowded for my taste. 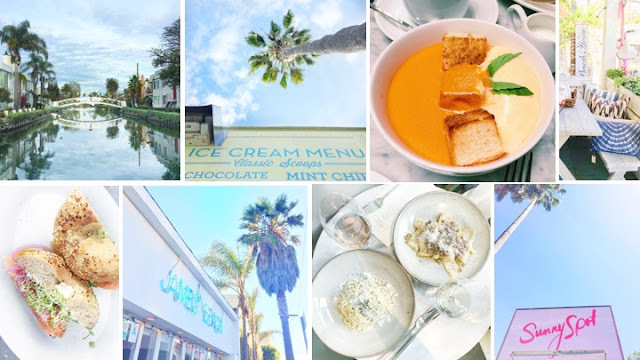 SANTA MONICA SNAPSHOT: Grab a casual breakfast at Bagel Nosh, take a bike ride through the residential area along Montana Avenue, head to Blue Plate Oysterette for lunch, stop for a slice of peanut butter and chocolate chiffon at Sweet Lady Jane, lounge on the beach, explore Main Street shops, catch the sunset with drinks on the rooftop at Shangri-La, dinner at Giorgio Baldi, post dinner drinks at Bar Chloe, late night pizza at Joe's. Where to see the sunset: Drinks: Hotel Shangri-La rooftop, the bar at Casa Del Mar, or The Bungalow. Dine: The Penthouse at the Huntley Hotel, Coast at Shutters, or Ivy at the Shore. Just to watch: Palisades Park, Santa Monica Beach and Temescal Canyon Park. Beverly Hills: Oh what a place! It's everything everyone imagines, a perfect example of America's most pristine suburb where the grasses are extra green, the food/fashion/events are all top of the line and even the dogs exert a certain chicness. Everything is always 'just right' and extra fabulous in Beverly Hills, making it a lovely place to go for an afternoon to be fancy. 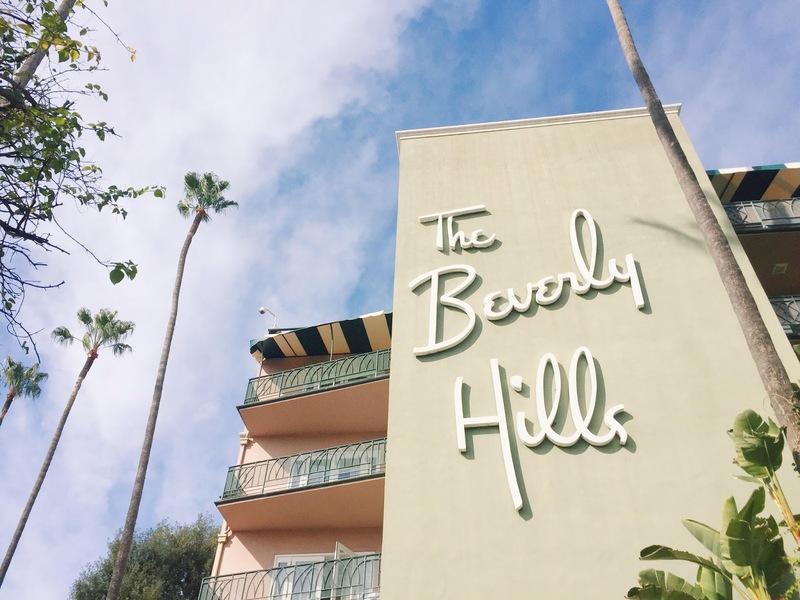 My favorite spot of course is The Beverly Hills Hotel. It's the most classic place and honestly my favorite spot in all of Los Angeles, particularly, the adorable 50's style diner in the basement. I love to go there anytime of day, order a grilled cheese sandwich and a milkshake in my poodle skirt and domino shoes before the sock hop. Aside from the basement diner, my next favorite spot is the Cabana Cafe, a poolside restaurant that will instantly make you feel like you're on vacation, with beautiful and delicious cocktails, like the rosé sangria cocktail I love to drink/Instagram and delicious truffle fries, among many other great things. It's the kind of place that takes lunch to another level. And of course there are many other places in Beverly Hills that do the same, including the Polo Lounge (another restaurant at the Beverly Hills Hotel), Georgie, Fred's, and Via Alloro. My second favorite spot in all of Beverly Hills is the bar at Hotel Bel-Air. It's an intimate, upscale bar with great little tables, reminiscent of an old school cafe (not the coffee kind, but the glamorous night out kind). It's a really small place but they have great live music almost every night and yummy snacks and drinks to pair. It's a perfect after dinner spot when you're not quite ready to head home but also want something a little less crowded. Another spot in Bel-Air worth mentioning is Vibrato, a delicious restaurant with live jazz music every night. It's really something of another time and I haven't been anywhere else like it! My third favorite spot is Greystone Mansion, the most beautiful public park and garden in Los Angeles, in my opinion. 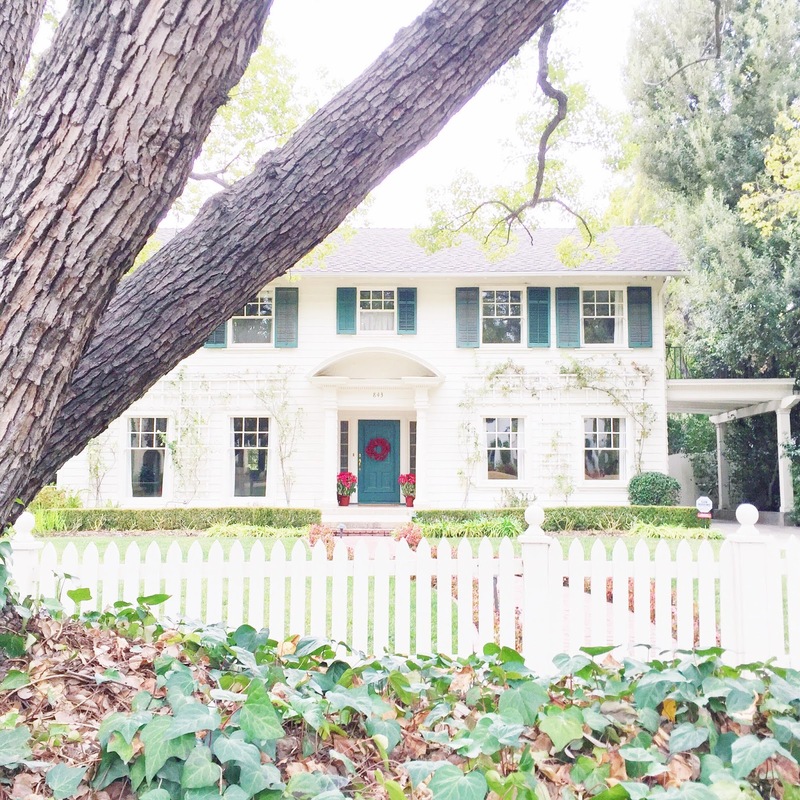 I love the beautiful Italian cypress trees, the view of the city skyline and the stunning Tudor revival mansion that's been in a number of movies and television shows, including Richie Rich and Gilmore Girls. And if you're a cheese addict like myself, make sure to grab a slice of something wonderful at the Cheese Store of Beverly Hills! BEVERLY HILLS SNAPSHOT: Lunch at the Cabana Cafe at the Beverly Hills Hotel, grab a latte and macarons at Ladurèe, take a walk down Rodeo Drive, stroll the gardens at Greystone Mansion Park, grab a sunset cocktail at the Waldorf Astoria, head to dinner at Madeo's, grab a nightcap and listen to live music at Hotel Bel-Air. West Hollywood: In my opinion West Hollywood is kind of the center of what most people imagine Los Angeles to be. Celebrities, hotspots, trendy fashion, Hollywood nightlife, coffee spots equally as chic as the boutiques on Melrose Avenue. I love going to West Hollywood for all those reasons, especially all the delicious food and amazing people watching. There's always a new place opening that is cool and pretty but I happen to love the classics, whatever that's worth in this city of newness; places like Dan Tana's, Sunset Tower, Chateau Marmont and Craig's (only opened about 7 years ago but that's a century by LA standards). I love taking people to the Mondrian Hotel because it's just so Los Angeles. It feels straight out of an episode of The Hills with a beautiful pool and stunning view of the city. Everyone gets dressed up and there really is no other place like it. The restaurant has changed three times since I have lived here but they all have a beautiful view and are pretty easy to grab a reservation at. Currently, Ivory on Sunset, has pretty decent food, good drinks and I am obsessed with the blue and white plates! I recommend grabbing dinner there for sunset and then heading to Skybar around the pool, directly next to the restaurant. The Roger Room is great for grabbing drinks with a date or a small group. It's this hidden gem (literally hard to find because there is no sign) and will instantly make you feel like you stumbled upon a forbidden speakeasy from the prohibition era. Catch is a fun, young, cool spot with a great menu and beautiful cocktails. Deliah, The Nice Guy and basically any spot by the h.wood group always has a cool crowd frequenting their very trendy locations. For a fun club night I love going to Roku for dinner and Bootsy Bellows or Doheny Room for a true 'club' experience. Other less intense spots for a night out I like are Palihouse, Catch, and Ysabel. In addition to the classic nightlife, West Hollywood also has lots of other fun things to do during the day. Some of my favorites being hiking the very sceney Runyon Canyon, shopping on Melrose and sunset plaza. If you're into design, the whole design district is very well established and serves as a mecca for all the top design firms and decorators. Some of the top spots being The Pacific Design Center, Gracie, Waterworks, and Mecox. 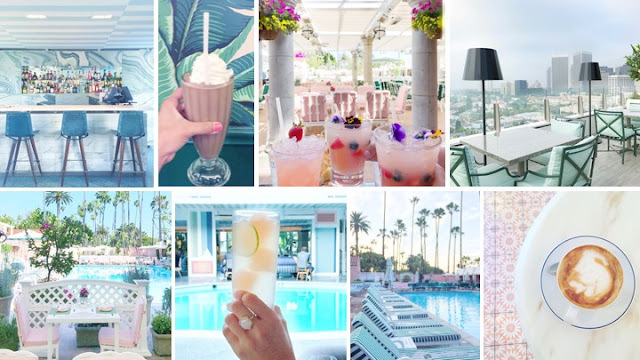 WEST HOLLYWOOD SNAPSHOT: Grab a morning drink at Alfred's Tea Room, hike Runyon Canyon, eat lunch at The Ivy, peruse the chic shops at Melrose Place, grab sunset drinks at Skybar, dinner at Craig's, after dinner drinks at Chateau Marmont. Rooftop Drinks: Skybar at the Mondrian Hotel, Palihouse (in the summer only), The Jeremy Hotel, Sunset Tower Hotel, E.P + L.P. Rooftop, The London Hotel, and Pearl's. Malibu: LA's chic ocean oasis, Malibu serves as everyone's little slice of Southern California heaven. It's a small place really, with a pretty relaxed vibe everywhere you go. I love Malibu's proximity to Brentwood, the drive down to PCH being half the fun. Aside from the obvious beautiful beaches, Malibu also has some great spots to eat or sip rosè at sunset. So starting with the obvious, here are some great spots to do just that. 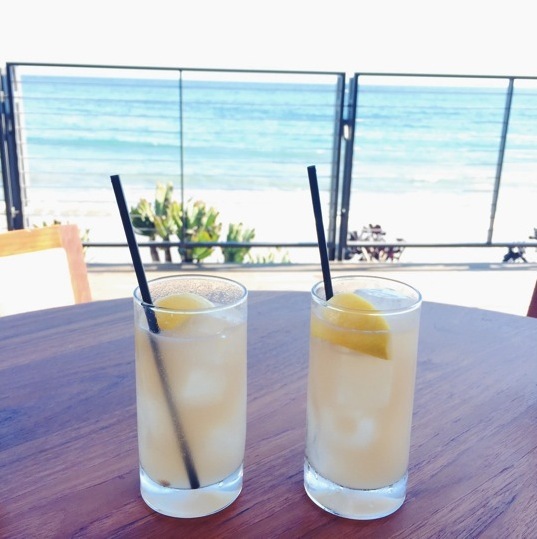 Nobu, Malibu Farm and Moonshadows are my favorite spots for a drink before dinner, or to hang for the afternoon. Nobu can be super sceney but I happen to love watching all the Instagram models in their five inch heels and short skirts prance around for a photo (I'm no better let's be real) and the cool celebs play it cool in $500 ripped jeans trying as hard as possible to not try. The food is really good, I prefer Katsuya, but the views are worth it. You can also just go for drinks and spend an afternoon with friends in the outdoor open seating area. Moonshadows has an equally beautiful view and is much more casual a place, with a great outdoor patio overlooking the water and yummy bar menu. I've never been for dinner but it looks very beautiful! Malibu Farm is another awesome spot that has a daytime, causal spot at the very end of the pier perfect for a post hike or beach day lunch, in addition to the restaurant offering ocean views as well and both lunch and dinner. They are great for larger groups and is located right next to one of my favorite photo op spots, the ocean rocks off the parking lot. MALIBU SNAPSHOT: Hike Mishe Mokwa, grab a coffee at Malibu Farm Cafe on the water, peruse the shops at the Malibu Country Mart, take some snacks and a book to the surfer beach and lounge, freshen up and grab a drink at Nobu, dinner at Taverna Tony's and after dinner drinks at Moonshadow's blue lounge. 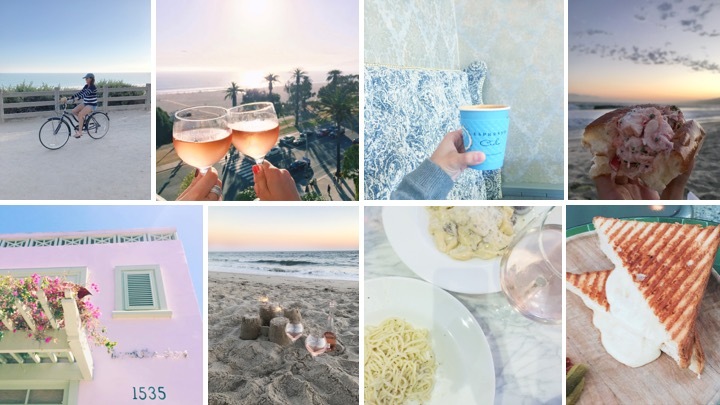 Where to see the sunset: Drinks: Nobu, Geoffrey's Malibu, Moonshadows, Malibu Farm Restaurant, The Surfrider Malibu Dine: Mastro's Ocean Club, Nobu, Geoffrey's Malibu, Moonshadows, Malibu Farm Restaurant Just to Watch: El Matador State Beach, Zuma Beach, The Malibu Pier, and Surfer Beach. Venice: It's the very cool place for very cool people who don't want to describe themselves that way but certainly think it and want others to as well. I love the Venice culture, which seems to be a confused combination of skater boys, hipsters, hippies, techies and other people who just want to be laid back but still have access to be the best food and style. Venice is a great place to go for dinner and drinks with tons of great restaurants and shopping. I love to try out some outfits that wouldn't be so well received in Santa Monica or West Hollywood, like denim shorts and an embellished blazer or a fur vest and floppy felt hat. People are a bit more adventurous with their fashion choices and it's great people watching for me. Some of my favorite things to do there is definitely dinner at Rose Cafè where I religiously order their cacio e peppe, paella fried rice and sea cucumber cocktail. It's a great place to be anytime of the day, my friend swears they have the best avocado toast at brunch and I go there sometimes for coffee and to get work done. Another place I love in Venice is Gjusta, a bakery that serves delicious deli food and more. I try to order something different every time I go because it's all just so good but some favorite of mine is a custom lox bagel sandwich, the turkey Rueben, and any of the delicious pastries and jam. Just FYI, it's located in a very heavily populated homeless encampment which I don't worry much about when I visit since they have a small parking lot and many of the people have no interest in bothering anyone. Other great spots for a more formal brunch are Salt Air, Tasting Kitchen and Sunny Spot. For dinner, Felix, Gjelina and Scopa (order the rigatoni and the rice ball). For post beach drinks I love the margarita selection at James Beach but don't go too late unless you want a huge crowd of young twenty year olds spilling all over your purse and shoes. I also like The Otheroom which is very minimalist and low key with a wine and beer menu only. A great spot for day drinking or to see the sunset is Hotel Irwin, which is really the only the rooftop in Venice. Also don't miss the rose latte at Flowerboy Project, they sprinkle actually rose petals on top and it's beautiful! As for the beach, I don't do Venice Beach or the boardwalk but if you're into it have a great time. Be safe! VENICE SNAPSHOT: Grab coffee and morning flowers at Flowerboy Project, brunch at Gjusta, stroll down the Venice Canals and Abbott Kinney, grab a sunset drink at Hotel Irwin's rooftop and dinner at Scopa or Southend. Pasadena: What I love most about this city is that it feels so far from what I traditionally consider Los Angeles. Pasadena holds a certain charm I often long for that reminds me of my hometown of Chicago probably because of very green landscape, classic American homes and also because I have family who live there. It's steeped in history and a legacy that just feels so different from the "newness" Los Angeles and the rest of Southern California exudes to me. It's almost as if it's of another time and every time I visit I am instantly transported. I often go to see my family and so when we get out the house it's often to the beautiful Huntington Botanical Gardens which has the best selection of all types of gardens, my favorites being the rose garden, the Japanese garden and the bonsai tree collection. Make sure to try the delicious egg rolls in the Chinese Garden! We also love talking walks around the Rose Bowl and Arroyo Secco. Pasadena has a great city center in Old Town with lots shops and great restaurants. Some of my favorites being 21 Choices Frozen Yogurt, Sushi Enya and Saladong. I haven't really spent much time going out at night in Pasadena but there are lots of great places for dinner and drinks listed below! 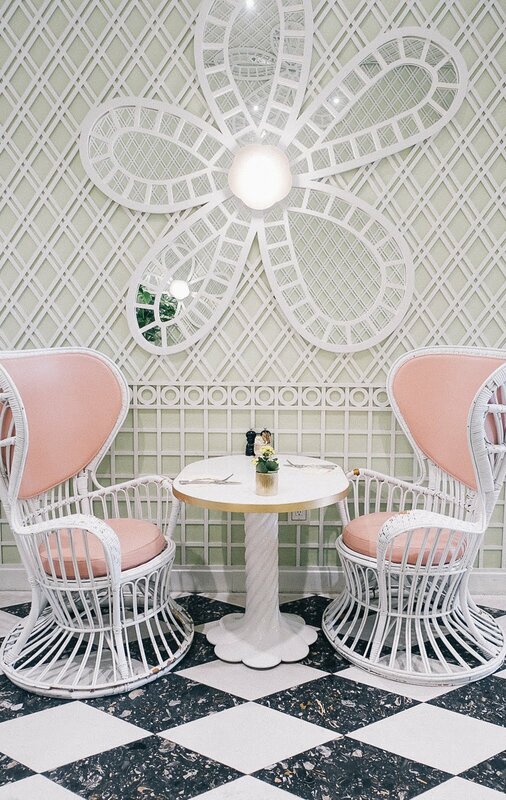 PASADENA SNAPSHOT: Grab some yummy toast and coffee at Lavender and Honey Espresso Bar, stroll the Huntington Gardens, afternoon tea at the Langham Hotel. Downtown Los Angeles: Like all the areas in Los Angeles, downtown Los Angeles has it's own very unique vibe as it's the most metropolitan landscape in all of Southern California with many skyscrapers, rooftops and a busy group of people. DTLA has lots of great restaurants and art as it's becoming more and more popular as a place to live rather then just work and visit. One of the main attractions I like is The Walt Disney Concert Hall which is stunning and the winter home of the Los Angeles Philharmonic. It's beautiful inside with state of the art sound and stunning design. Another wonderful venue downtown is The Theater at Ace Hotel and Staples Center which houses the LA Kings, The Lakers and the Clippers. Staples Center also has a lot of great concert and has it's own little city center with tons of restaurants and bars to frequent after or before a game or show. Some other things I love doing in DTLA is checking out the amazing flower market which is where everyone goes early in the morning for the best selection and price. 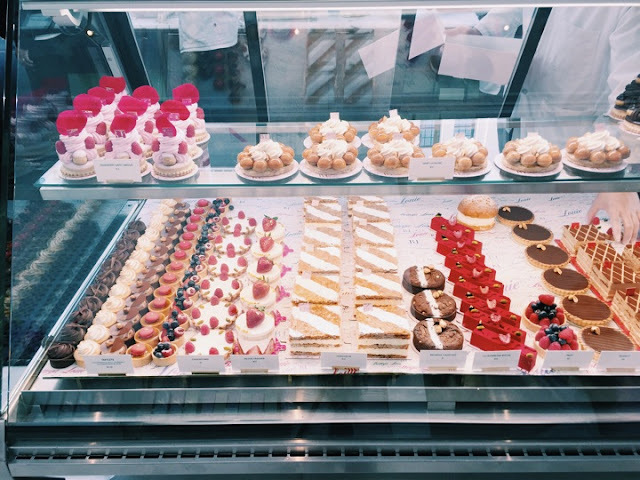 Bottega Louie is probably my go to spot anytime of the day for a meal or to knock out some work during the day with a nice latte. It's a beautiful restaurant with mainly Italian food but also a full selection of French treats in and a highly instagrammable patisserie. Another beautiful restaurant with great food is Spring which has such a beautiful pastel dinning room and natural light! The Ace Hotel rooftop is perfect for drinks at sunset and I love going there before dinner or an event downtown. 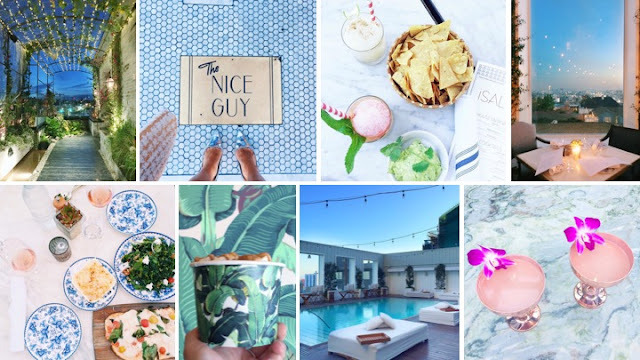 DTLA SNAPSHOTS: Wake up early to pursue the flower market, grab coffee at Ludlow, brunch and pretty cocktails at Bottega Louie, slide down with a view of the city skyline at SkySpace, dinner at Faith and Flower. Rooftops: Ace Hotel & Rooftop, Broken Shaker, Perch, Spire 73, and NoMad Hotel. A classic Mexican restaurant in the valley loved by everyone. The most beautifully done mall in Los Angeles, designed of course by the one and only Kelly Wearstler, one of my favorite interior decreers. This mall takes it to another level. And thank goodness because it took forever for the most recent renovation to get done. With everything you need from gourmet candy shops, fun restaurants, multiple high end stores, a beautiful food court and a big movie theater. Also be sure to check out the brand new Eataly, it's worth the wait! Full disclosure, I actually still haven't had a chance to go yet. BUT, I heard enough good things that I feel confident enough to give a recommendation. Who wouldn't love a food hall dedicated to just Italian? A super trendy new high end mall with multiple boutiques and cool coffee spots. Also, there is a Soulcycle. The hand down best frozen yogurt. You will think it's ice cream, make sure to bring cash and order a side of the many cookie dough options, vegan included. You're welcome. A small, family run business with the very best service and work. She has altered all my clothes since I first moved here and I wouldn't trust anyone else! This is what I consider a semi-fancy movie theater since there aren't crazy expensive luxury chairs but there are some small theaters with couches and extremely great service. I love to go here by myself and grab a vanilla latte and popcorn in the morning or afternoon. It's been my little safe heaven after crazy days at work or just excitement around the next movie I'm dying to see. The icing on the cake is that they just signed on to MoviePass which gives me great joy I have no other way to express! Where I get waxes from Michelle aka the best esthetician ever! The choices for fro-yo here are overwhelming but in a delectably delicious way. It's a must go for anyone on the Westside of Los Angeles with a sweet tooth. The facts are simple, I am fully addicted to the tsukemen and currently have only one friend who will frequent with me. You will either love or hate it, there's really no in between. Since I love the tsukemen (dipping ramen) I go to the Tsjuita on the corner, but if you love traditional ramen then I recommend the annex. And if you're not prepared for the real deal I recommend you go to Jinya, the more American version where you can customize the broth, meat and toppings. This page will continue to be updated as I come across many more lovely places in Los Angeles!